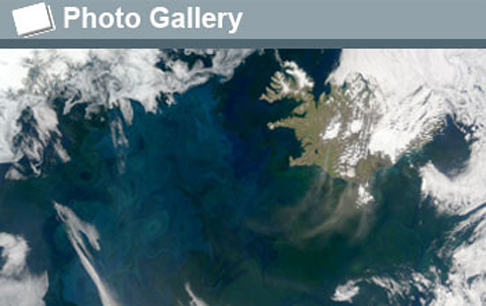 The North Atlantic Bloom: swirling artwork in the sea, plankton bloom in spring, summer. : Photograph courtesy of NASA Earth Observatory View a photo gallery showing the North Atlantic Bloom. On this July 4th week, U.S. beachgoers are thronging their way to seaside resorts and parks to celebrate with holiday fireworks. Across the horizon and miles out to sea toward the north, the Atlantic Ocean's own spring and summer ritual is unfolding: the blooming of countless microscopic plant plankton, or phytoplankton. In what's known as the North Atlantic Bloom, an immense number of phytoplankton burst into color, first "greening" then "whitening" the sea as one species follows another. 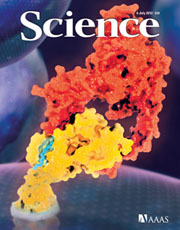 The researchers' work is described in the July 6, 2012 issue of the journal Science. : Photograph Copyright AAAS 2012In research results published in this week's issue of the journal Science, scientists report evidence of what triggers this huge bloom. Whirlpools, or eddies, swirl across the surface of the North Atlantic Ocean sustaining phytoplankton in the ocean's shallower waters where they can get plenty of sunlight to fuel their growth, keeping them from being pushed downward by the ocean's rough surface. The result is a burst of spring and summer color atop the ocean's waters. How important is the bloom to the North Atlantic Ocean and beyond to the global carbon cycle? Much like forests, springtime blooms of microscopic plants in the ocean absorb enormous quantities of carbon dioxide, emitting oxygen via photosynthesis. Their growth contributes to the oceanic uptake of carbon dioxide, amounting globally to about one-third of the carbon dioxide humans put into the air each year through the burning of fossil fuels. The North Atlantic is critical to this process; it's responsible for more than 20 percent of the ocean's uptake of carbon dioxide. An important scientific question is how this "biological pump" for carbon might change in the future as Earth's climate evolves. In winter, strong winds generate mixing that pushes phytoplankton into deeper waters, robbing them of sunlight but drawing up nutrients from the depths. As winter turns to spring, days are longer and plankton are exposed to more sunlight, fueling their growth. "Our results show that the bloom starts through eddies, even before the sun begins to warm the ocean," says Amala Mahadevan, an oceanographer at the Woods Hole Oceanographic Institution in Massachusetts and lead author of the Science paper. Co-authors of the paper are Eric D'Asaro and Craig Lee of the University of Washington, and Mary Jane Perry of the University of Maine. 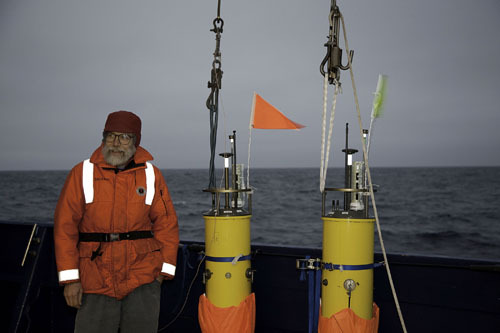 "Every undergraduate who takes an introductory oceanography course learns about the ecological and climate significance of the North Atlantic Bloom as well as what causes it," says Don Rice, program director in NSF's Division of Ocean Sciences, which funded the research. "This study reminds us that, when it comes to the ocean, the things we think we know hold some big surprises." The newly discovered mechanism helps explain the timing of the spring and summer bloom, known to mariners and fishers for centuries and clearly visible in satellite images. It also offers a new look at why the bloom has a patchy appearance: it is shaped by eddies that, in essence, orchestrate its formation. 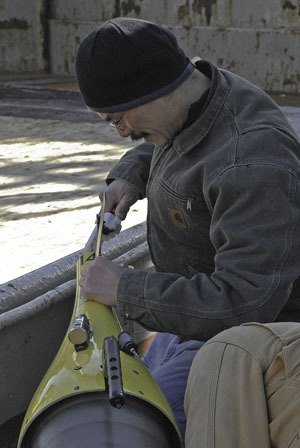 Marine scientist Craig Lee finishes assembly of an underwater glider. : Photograph courtesy of University of WashingtonMaking the discovery was no easy feat. "Working in the North Atlantic Ocean is challenging," says Perry, "but we were able to track a patch of seawater off Iceland and follow the progression of the bloom in a way that hadn't been done before." "Our field work was set up with floats, gliders and research ships that all worked tightly together," adds D'Asaro. "They were in the same area, so we could put together a cohesive picture of the bloom." 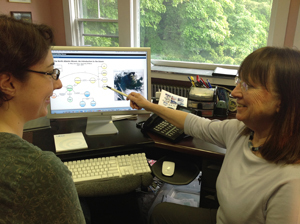 The scientists focused on phytoplankton known as diatoms. Diatoms live in glass houses--walls made of silica. "When conditions are right, diatom blooms spread across hundreds of miles of ocean," says Lee, "bringing life-sustaining food to sometimes barren waters." In April 2008, Lee, Perry and D'Asaro arrived in a storm-lashed North Atlantic aboard the Icelandic research vessel Bjarni Saemundsson. They launched specially-designed robots in the rough seas. A float that hovered below the water's surface was also deployed. It followed the motion of the ocean, moving around, says D'Asaro, "like a giant phytoplankton." The float and gliders measured the temperature, salinity and velocity of the water, and gathered information about the chemistry and biology of the bloom itself--oxygen, nitrate and the optical signatures of the phytoplankton. Scientists aboard two ships, the Woods Hole-operated research vessel Knorr and Iceland's Bjarni Saemundsson, visited the area four times. Soon after measurements from the float and gliders started coming in, the scientists saw that the bloom had started, even though conditions still looked winter-like. "It was apparent that some new mechanism, other than surface warming, was behind the bloom's initiation," says D'Asaro. 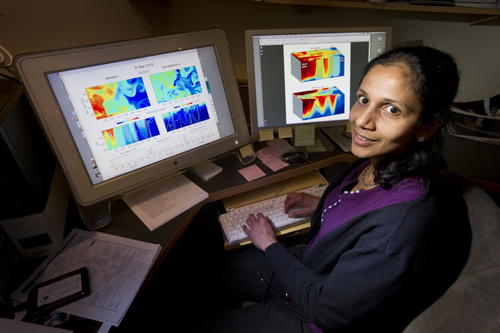 Enter Mahadevan, who then used three-dimensional computer models to look at information collected at sea by Perry, D'Asaro and Lee. She generated eddies in a model, using the north-to-south variation of temperature in the ocean. The model showed that without eddies, the bloom happened several weeks later and didn't have the space and time structures actually observed in the North Atlantic. In future research, the scientists hope to put the North Atlantic Bloom into a broader context. They believe that much could be learned by following the bloom's evolution across an entire year, especially with gliders and floats outfitted with new sensors. The sensors would look at the zooplankton that graze on a phytoplankton smorgasbord. These data could be integrated, say the oceanographers, into models that would offer a more complete story. "What we're learning about eddies is that they're a critical part of life in the ocean," says Perry. "They shape ocean ecosystems in countless ways." Eddies and phytoplankton, the researchers believe, are central to the oceanic cycling of carbon, without which climate on Earth would look very different. "We envision using gliders and floats to make measurements--and models--of ocean physics, chemistry and biology," says D'Asaro, "that span wide regions of the world ocean." And that, says Lee, would spark a new understanding of the sea, all from tiny plankton that each spring and summer bloom by the millions and millions. This news is from the National Science Foundation, 5 July 2012. The discovery is the result of an oceanographic expedition called ICESCAPE, or Impacts of Climate on EcoSystems and Chemistry of the Arctic Pacific Environment. The finding reveals a new consequence of the Arctic's warming climate and provides an important clue to understanding the impacts of a changing climate and environment on the Arctic Ocean and its ecology. (Credit: NASA's Goddard Space Flight Center). An ICESCAPE slide show is available at http://www.flickr.com//photos/gsfc/sets/.